Fermented foods are rapidly taking the U.S. by storm. Not only do they unlock a wide range of vitamins and nutrients, they also provide an excellent source of probiotics and they taste amazing! 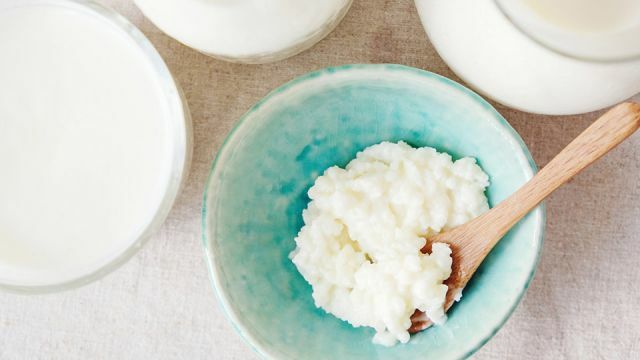 Sauerkraut, kimchi, kombucha and kvass have all had their time in the alternative health limelight, but now it’s time for coconut milk kefir to shine. And as far as fermented foods go, coconut milk kefir is very curious indeed. Kefir is traditionally made by culturing dairy milk with kefir grains — curiously small, gelatinous balls composed of beneficial bacteria and yeast living inside a tiny capsule of polysaccharide compounds. While these “grains” can only be made with the help of a dairy medium, that doesn’t mean they can’t be used in other types of liquids. For this reason, coconut-based kefir popularity has recently skyrocketed into popularity in the U.S. Sales of kefir in Lifeway, the largest kefir retailer in America, jumped from $58 million in 2009 to over $130 million in 2014…and this number only continues to go up. One of the reasons for this is that by using kefir grains to ferment things like coconut milk and coconut water, people who are lactose intolerant or dairy-averse can still enjoy its many benefits. And those benefits truly are many. Here are five benefits of coconut milk kefir. As you’re probably well aware, there are billions of microscopic organisms living in and on various parts of your body — especially your gut! In the gut, these little guys – who collectively comprise the “gut microbiome” — perform a wide range of important tasks, from carbohydrate metabolism to digestive enzyme production. Many people struggle to get the optimum nutrition from the foods they eat, simply because their gut microbiome has been damaged over the years by things like antibiotics, stress and contraceptives. Eating fermented foods like coconut milk kefir help to rebalance the gut microbiome and get you back on the road to optimum digestion. Coconut milk kefir contains several Lactobacillus species, along with a number of other beneficial bacteria and yeast species, that are associated with healthy gut function and improved nutrient absorption. The result is that, by eating coconut milk kefir, you’re helping to repopulate your gut with beneficial bacteria. This, in turn, improves digestive capacity, reduces gas and bloating after meals, and allows you to metabolize more nutrients from the foods you eat. The same probiotic powers of kefir that help support digestive capacity also promote a healthy immune system. Research shows that our bodies rely on the microorganisms living in our gut for several aspects of our immune response, with a compromised gut microbiome meaning our immune system is also compromised. Kefir, as a natural probiotic food, helps to support a healthy gut — and in so doing supports strong immunity. In addition to this, however, kefir contains Lactobacillus kefiri, a bacterial species found in no other food that has been shown to inhibit both gram positive and gram negative pathogens. This means that, in addition to boosting your immune system, eating coconut milk kefir can actually make your immune system’s job a whole lot easier by directly taking out some of the bad guys. Nice one kefir! Candida is a hot topic in the alternative health community these days, but for all the wrong reasons: in addition to contributing to yeast infections, in large doses it can cause a wide range of adverse side effects, create brain fog and sugar cravings, and compromise a person’s immune system. Kefir, it just so happens, has been shown to effectively treat Candida albicans. For this reason, getting a little coconut milk kefir into your daily diet should help you to keep your Candida overgrowth under control. The high concentrations of beneficial bacteria and yeast found in kefir make it an effective natural cancer treatment. In fact, the anti-carcinogenic ability of kefir is one of its most intensely studied benefits. While much of the research has been conducted on dairy or soy-based kefir, the same therapeutic properties exist in coconut milk kefir. Because most of the anti-cancer abilities of kefir relate to its microbiological properties, simply ensuring your coconut milk kefir still contains live cultures will guarantee its cancer-protective effects. The average American continues to eat an increasingly poor diet high in inflammatory foods and low in nutrient-dense, whole foods. The result is that the prevalence of food allergies is rapidly on the rise, with over 15 million Americans estimated to have some form of food allergy. Anything that can help to treat those food allergies, then, is definitely a good thing. And rather than relying on anti-histamines and other side-effect-laden prescription drugs, why not simply invest in some coconut milk kefir? Hey Buddy!, I found this information for you: "5 Benefits Of Coconut Milk Kefir". Here is the website link: https://www.thealternativedaily.com/5-benefits-of-coconut-milk-kefir/. Thank you.